Toyota Kirloskar Motor is increasing export of its Etios range of cars from India to Africa, while it also looks to enhance foothold in the Indian market with the launch of new versions of sedan Etios and hatchback Liva with prices starting at Rs 446,000. "Last year, we started exports of Etios to South Africa and we have so far shipped 20,000 units. BR> "We are looking at exporting the model to other countries neighbouring South Africa. We have in fact started exporting to Zimbabwe and Mauritius," Toyota Kirloskar Motor Managing Director and Chief Executive Officer Hiroshi Nakagawa said. Export is another focus point and the company would look to increase it further going forward, he added. The company has launched the new version of Etios at a price range of Rs 545,000 and Rs 708,000 for the petrol variant and Rs 670,000 and Rs 815,000 (ex-showroom Delhi) for the diesel variant. The new hatchback Etios Liva will now cost between Rs 446,000 and Rs 599,000 for petrol option and Rs 572,000 and Rs 638,000 (ex-showroom Delhi) for diesel variant. "There has been an increase in prices of these two vehicles by about 2.1 per cent to 2.5 per cent from the previous version," TKM deputy managing director and chief operating officer (marketing and commercial) Sandeep Singh said. 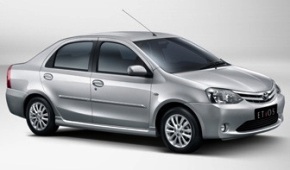 The Etios was launched in December, 2010 followed by Etios Liva in June 2011. Since then, the range has sold more than 1,45,000 units. The company also said it is offering Etios Liva TRD Sportivo, a new 1.5 litre engine as a regular grade. "As a part of our product lifecycle and with the aim to bring newness to the lineup we are launching the new Etios and Etios Liva. "We have incorporated customer feedback and are looking forward to delighting more customers with the new vehicles," Singh said. The firm, in its bid to reach out to more customers after the launch of the Etios and Etios Liva, has expanded its dealer network from 97 dealerships in 2009 to 220 outlets currently. "TKM is looking at improving its reach and is setting up new outlets in semi urban and rural areas. "The company further plans to expand it to 235 dealerships by the end of March this year," the company said. Asked about the company's plans to set up a diesel engine manufacturing plant in India, Nakagawa said it hasn't been finalised yet. He said the market continues to be difficult but a recovery is expected in the later part of the year if interest rates come down and government takes other steps to lift the consumer sentiments. VOTE: Sexiest India covergirl this March!